Everything you expect from a Raymond. Complete with our Raymond RENEWED Assurance Buy-Back Guarantee. Raymond RENEWED Pre-Owned lift trucks are exceptionally engineered, energy efficient and provide a quality lift truck at an affordable price. 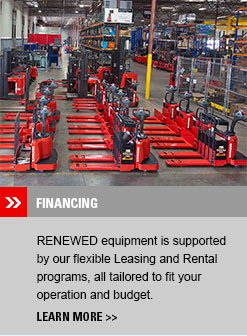 We meticulously select and service Raymond lift trucks for our Raymond RENEWED program. We take pride in providing exceptional value and in the fact that our Raymond RENEWED lift trucks look and perform like new. 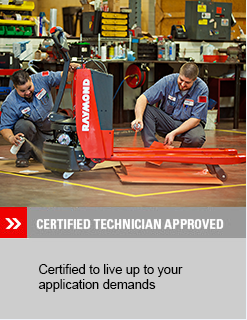 Our pre-owned program provides easy access to thousands of Raymond and other manufacturers' lift trucks. Our Customer Support Team is focused on providing what you need at very economical price points. We take pride in providing exceptional value and in the fact that our lift trucks perform as expected. And our goal is to make acquiring renewed lift trucks as easy as picking up your phone and contacting our Pre-Owned Equipment Department...then simply choosing what you need from our wide selection of renewed models, brands and options.